President Trump wants a grand bargain with China. And hardliners in the Trump administration worry Trump could be led down an accommodationist path that — in their minds — would betray the President's economic agenda and capitulate to Beijing. Trump inflamed those internal fears today with this tweet that signaled he's willing to give away significant things for a deal: "President Xi of China, and I, are working together to give massive Chinese phone company, ZTE, a way to get back into business, fast. Too many jobs in China lost. Commerce Department has been instructed to get it done!" Trump is making a potentially stunning concession with ZTE. The Chinese telecommunications giant is fighting for its life. It’s been sanctioned for doing business with Iran and North Korea, and the U.S. Commerce Department banned American companies from selling it their products. 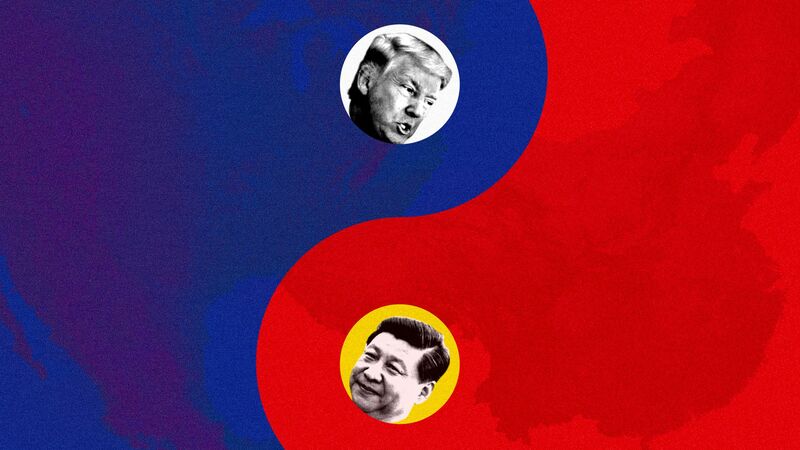 Between the lines: Senior Treasury and National Economic Council officials — including Mnuchin and Larry Kudlow, who recently returned from Beijing — are optimistic that Trump may cut a deal with China in the coming weeks. Sources familiar with Mnuchin's thinking tell me he wants a deal that would have the Chinese buy billions of dollars worth of U.S. products. The idea would be to cut the trade deficit — something Trump is obsessed with — but trade experts say that purchasing products isn't the way to deal with profound structural imbalances. In exchange, the U.S. would drop the section 301 tariffs designed to stop China from stealing American intellectual property and getting its hands on U.S. technology for nefarious purposes. What's next: Vice Premier Liu He, who has been leading China's trade talks with the Trump administration, plans to visit Washington this week or next. His team has been in town the past two days preparing for the meeting. The administration hasn't planned for Liu He to meet with President Trump, but two sources familiar with the talks speculate that Trump may not be able to help himself — he'll likely want to take over the negotiations and meet with Liu He in the Oval. The Trump team is bitterly divided over what's happening with China. Mnuchin and Kudlow want a deal like I describe in item 1 above. But while hardliners Peter Navarro and Bob Lighthizer have been publicly silent, people familiar with their thinking say that they believe it would betray Trump’s economic agenda, missing a once-in-a-generation opportunity to force China to change its industrial practices. This White House leaks like there’s no tomorrow. The leaks come in all shapes and sizes: small leaks, real-time leaks, weaponized leaks, historical leaks. Sensitive Oval Office conversations have leaked, and so have talks in cabinet meetings and the Situation Room. You name it, they leak it. My colleague Mike Allen, who has spent nearly 20 years covering the White House, says we learn more about what's going on inside the Trump White House in a week than we did in a year of the George W. Bush presidency. This White House leaks so much that meetings called to bemoan leaks begin with acknowledgement the bemoaning will be leaked, which is promptly leaked...by several leakers in a smallish room. Why does this White House leak like it’s going out of style? I reached out to some of the Trump administration’s most prolific leakers — people who have been wonderful sources to me (and, I assume, plenty of other reporters) — to get them to explain the draw. "To be honest, it probably falls into a couple of categories,” one current White House official tells me. "The first is personal vendettas. And two is to make sure there's an accurate record of what's really going on in the White House." "The most common substantive leaks are the result of someone losing an internal policy debate," a current senior administration official told me. "By leaking the decision, the loser gets one last chance to kill it with blowback from the public, Congress or even the President. "Otherwise," the official added, "you have to realize that working here is kind of like being in a never-ending 'Mexican Standoff.' Everyone has guns (leaks) pointed at each other and it's only a matter of time before someone shoots. There's rarely a peaceful conclusion so you might as well shoot first." A former senior White House official who turned leaking into an art form made a slightly more nuanced defense of the practice. "Leaking is information warfare; it's strategic and tactical — strategic to drive narrative, tactical to settle scores,” the source said. Another former administration official said grudges have a lot to do with it. "Any time I leaked, it was out of frustration with incompetent or tone-deaf leadership,” the former official said. “Bad managers almost always breed an unhappy workplace, which ultimately results in pervasive leaking," the former official added. "And there has been plenty of all those things inside this White House. Some people use leaking to settle personal scores, or even worse to attack the President, but for me it was always to make a point about something that I felt was being unjustly ignored by others." Be smart: To any would-be leakers who are considering the practice, I'm also told leaking is pretty fun. Give me a call if you'd like to try it out. Multiple officials from foreign governments who deal with the White House have all made the same observation to me recently: this administration is stretched too thin. There is barely enough top flight talent confirmed across the government to manage the basic day-to-day, let alone the dizzying array of foreign policy battlefronts Trump has opened up — especially when it comes to trade. He's trying to cut a major economic deal with China, while threatening them with tariffs on $150 billion worth of Chinese imports. He's about to meet with Kim Jong-un to try to denuclearize the Korean Peninsula, an effort inextricably linked to China and the bullet point above. He's trying to wrap up NAFTA negotiations with Canada and Mexico, while threatening both countries with massive steel and aluminum tariffs. He's threatening the rest of the world with steel and aluminum tariffs, and his team is going through a lengthy and complicated process of determining which countries and products get exemptions. There's about 9,000 of the latter! His team is working through the fine details of the renegotiated U.S.-Korea trade deal after reaching an agreement in principle. There are barely enough Trump administration officials to handle all of this. And I haven't even mentioned just the regular day-to-day work at the World Trade Organization (and sanctions and trade remedies) — which is also very busy! "Even if you just look at the trade component of this, it is overload in terms of the amount of work that needs to be done, the stakes of things, and the complexity of these negotiations,” said one source close to the White House who has discussed the overcapacity problem with senior officials there. "There's not enough bandwidth to do it all at once — both from the staffing perspective, and just from our ability to be engaged in so many fronts internationally simultaneously," the source said. “You’ve got four or five different major trade negotiations, all high stakes, all with a time fuse of a sort," the source added. "I remember just a couple months ago [U.S. Trade Representative Bob] Lighthizer complaining that he only had one political person, confirmed person, in with him." The pushback: USTR spokeswoman Emily Davis noted that the situation has recently improved with the Senate finally confirming their nominated deputies in March. "With four deputies in place, the best career staff in the government, and the necessary expertise, USTR is fully capable of carrying out its responsibilities," she told me. The House expects to reauthorize the VA "Choice Program" and pass the Farm Bill, a senior Republican aide tells me. The Senate will confirm the remaining judges in their current tranche (for a total of six in nine days.) They'll also likely consider additional judicial nominees. The Senate will also vote on on Sen. Markey’s Congressional Review Act (CRA) resolution to "put strong net neutrality rules back on the books." Democrats have forced this vote — which Mitch McConnell opposes — and look like they can squeeze it through the Senate with the support of Republican Susan Collins. A senior Democratic aide explained the political machinations behind the vote: "Millennials and younger voters live online and on their phones, so net neutrality means a great deal to them. This week will make clear that Democrats are for a free and open internet, and Republicans are yet again on the side of the corporate special interests." Bottom line: It may be a good election year issue for Democrats but has no hope of passing the Republican-controlled House. Monday: Lunch with Vice President Mike Pence. And on Monday, Jerusalem time, history will be made. Trump administration officials Steven Mnuchin, Jared Kushner, Ivanka Trump, Jason Greenblatt and David Friedman are all at the scene to mark the opening of the new, relocated, U.S. embassy in Israel's capital. Tuesday: Trump speaks at the 37th Annual National Peace Officers’ Memorial Service. He also has lunch with Senate Republicans. Wednesday: Trump hosts the president of Uzbekistan at the White House. Thursday: Trump has lunch with Defense Secretary James Mattis. 6. 1 mum thing: Happy Mother's Day! I'm lucky to have such a caring, smart, big-hearted mother. And she's a loyal Sneak Peek reader to boot! Love you, Mum!